QickPick launched in early 2014, bringing a game changing hat to the music and guitar industry. 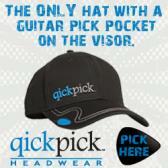 The QickPick pocket on the edge of the hat visor allows guitar players to have quick access to their guitar picks. We have a variety of styles from trucker hats, baseball style caps and flat brim hats. We are growing our brands monthly as more musicians, bands, brands and instrument companies hear about us. Sign up today for exclusive affiliate program and earn 10% commission on every QickPick Hat that you well through your website, social pages or videos. With a background in the promotional product industry we started selling custom logoed hats to businesses, bands, retailers, manufacturers and other music related organizations. The Country Music Association was our first customer when they ordered custom hats to give away at the 2014 CMA Fest in Nashville. Other customers include Neal McCoy, Grand Ole Opry, Country Music Hall of Fame, Pick World, Gravity Guitar Picks, Gallagher Guitars and many more. Many of our custom hats can be found online along with our new United We Stand collection, with artwork designed by legendary artist, Tom Zotos. Music fans and guitar players love our hats for the innovative guitar pick pocket. They wear our hats for the edgy graphics and cool brands available. They buy our hats for the top quality and value provided. Become a customer and experience it all for yourself.